Subject: Should I Buy Chipotle Stock Following Q1 Earnings? × 6 = fifty four Required Please enter the correct value. Chipotle Mexican Grill Inc. (NYSE: CMG) reports earnings on Tuesday, April 26, and with Chipotle stock down 8% year to date, many investors are wondering if they should buy Chipotle stock at these low levels. But before we get into our Chipotle stock recommendation, here's what's expected from the fast-causal restaurant chain when its reports Q1 2016 results after tomorrow's close. Chipotle has been plagued by a string of food-borne illnesses and regulatory investigations over the past six months. Now, the Tex-Mex restaurant chain is expected to post its first-ever quarterly loss since its highly successful 2006 initial public offering. Sales are expected to have declined for the third straight quarter. And quarterly revenue is projected to be at its lowest level since the end of 2013. Analysts expect Chipotle to report an earnings per share (EPS) loss of $0.86 to $0.94. That would be down from a gain of $3.88 per share in the same quarter a year ago. Revenue is expected at $868.5 million. That would be a 20.2% year-over-year drop from the $1.09 billion earned in the first three months of 2015. The Chipotle stock price has fallen 32.4% over the last six months after E coli, salmonella, and norovirus outbreaks sickened hundreds across the United States. Federal prosecutors in central California have asked for three years' worth of information on Chipotle food safety matters and are still sifting through the data. The CMG stock price did rebound in February however, after the CDC declared that Chipotle's E coli outbreak was over. But Chipotle stock still remains down 8% in 2016 and 6.4% in the last month. Despite Chipotle's best efforts to fix the outbreak issues, we still recommend avoiding Chipotle stock for the foreseeable future. The company has used a number of marketing ploys, including free burrito and chip giveaways, to get people back into its restaurants in 2016. But those haven't been able to stop CMG stock's slide. Investment firm Cowen & Co. wrote in an investors' note that the freebies have improved traffic in the near term, but it's not a sustainable strategy. Plus, Chipotle's one-time enviable reputation as a healthy, fresh, and eco/animal friendly company may be irreversibly damaged. Many previously loyal customers have vowed to never return. And attracting new customers from the current reputation-focused generation will be challenging. Earlier this month, Goldman Sachs downgraded Chipotle stock to "Neutral" from "Buy." The investment bank said social media data suggests customer opinions of Chipotle remain concerning. Another concern is Chipotle's plan to venture into the crowded fast-casual hamburger space. In late March, Chipotle filed to trademark the name "Better Burger." Securities firm Maxim Group said while it's the right idea, it comes at the wrong time. Maxim noted that Chipotle may prove a compelling yet late entrant in the arena. 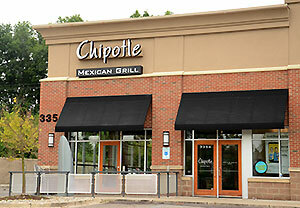 But the firm added its priority should be on reversing the slumping sales trends at its flagship Chipotle chains. Money Morning has been covering the health scares at Chipotle and the subsequent sales declines since they began. We have been bearish on Chipotle stock for several months and remain so. Although the worst may be behind it, Chipotle stock is far from in the clear. First-quarter results might beat forecasts, with expectations so low. But whatever the figures, there won't be much to get excited about. The Chipotle stock price today was down 0.28% at $441.56 in early morning trading. Expect much more volatility when the EPS figures are released.